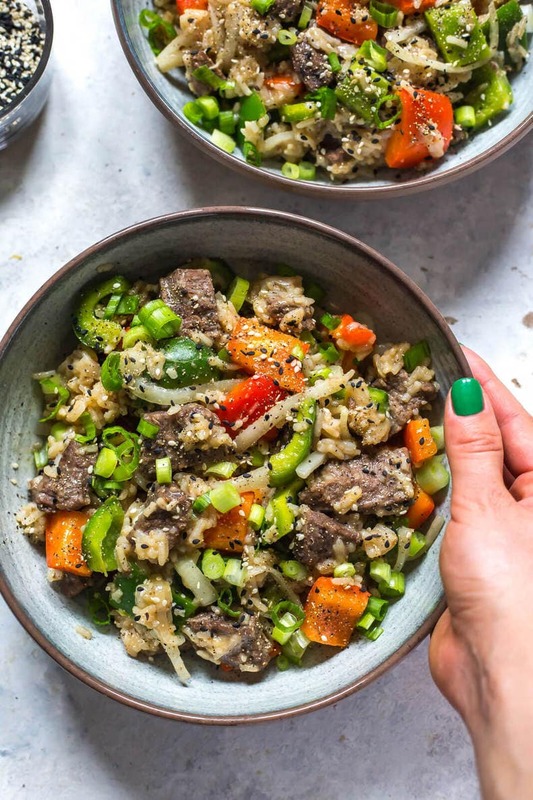 This Easy Instant Pot Pepper Steak is a delicious 30-minute dinner idea that is packed with bell peppers, onions, sirloin steak and a tasty soy-pepper sauce! Add olive oil, steak, soy sauce, honey, rice vinegar, garlic, black pepper, water and jasmine rice to the Instant Pot in that order. Cook on high pressure for 3 minutes. Instant Pot will take 10-15 minutes to preheat then the 3 minutes on high pressure. Do a quick release of the pressure. When safe to do so, open lid and stir in onions and peppers, then replace lid and let sit 5-10 minutes until veggies soften. Serve garnished with green onion and sesame seeds. Enjoy!